The quick-witted duo, Santosh and Siya Kumar, run Paris Dé Saloń, a successful beauty salon in the city. Together, they have won various awards for maintaining European standards of beauty services at their establishment. 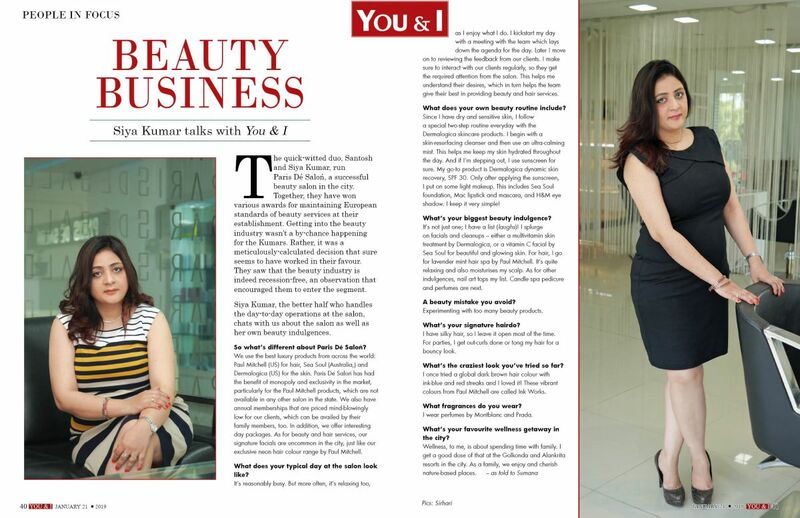 Getting into the beauty industry wasn’t a by-chance happening for the Kumars. Rather, it was a meticulously-calculated decision that sure seems to have worked in their favour. They saw that the beauty industry is indeed recession-free, an observation that encouraged them to enter the segment. Siya Kumar, the better half who handles the day-to-day operations at the salon, chats with us about the salon as well as her own beauty indulgences. So what’s different about Paris Dé Saloń? We use the best luxury products from across the world: Paul Mitchell (US) for hair, Sea Soul (Australia,) and Dermalogica (US) for the skin. Paris Dé Saloń has had the benefit of monopoly and exclusivity in the market, particularly for the Paul Mitchell products, which are not available in any other salon in the state. We also have annual memberships that are priced mind-blowingly low for our clients, which can be availed by their family members, too. In addition, we offer interesting day packages. As for beauty and hair services, our signature facials are uncommon in the city, just like our exclusive neon hair colour range by Paul Mitchell. What does your typical day at the salon look like? It’s reasonably busy. But more often, it’s relaxing too, as I enjoy what I do. I kickstart my day with a meeting with the team which lays down the agenda for the day. Later I move on to reviewing the feedback from our clients. I make sure to interact with our clients regularly, so they get the required attention from the salon. This helps me understand their desires, which in turn helps the team give their best in providing beauty and hair services. What does your own beauty routine include? Since I have dry and sensitive skin, I follow a special two-step routine everyday with the Dermalogica skincare products. I begin with a skin-resurfacing cleanser and then use an ultra-calming mist. This helps me keep my skin hydrated throughout the day. And if I’m stepping out, I use sunscreen for sure. My go-to product is Dermalogica dynamic skin recovery, SPF 30. Only after applying the sunscreen, I put on some light makeup. This includes Sea Soul foundation, Mac lipstick and mascara, and H&M eye shadow. I keep it very simple! It’s not just one; I have a list (laughs)! I splurge on facials and cleanups – either a multivitamin skin treatment by Dermalogica, or a vitamin C facial by Sea Soul for beautiful and glowing skin. For hair, I go for lavender mint hair spa by Paul Mitchell. It’s quite relaxing and also moisturises my scalp. As for other indulgences, nail art tops my list. Candle spa pedicure and perfumes are next. A beauty mistake you avoid? Experimenting with too many beauty products. I have silky hair, so I leave it open most of the time. For parties, I get out-curls done or tong my hair for a bouncy look. What’s the craziest look you’ve tried so far? I once tried a global dark brown hair colour with ink-blue and red streaks and I loved it! These vibrant colours from Paul Mitchell are called Ink Works. I wear perfumes by Montblanc and Prada. What’s your favourite wellness getaway in the city?